Check out these funny Cartoon Pumpkin Stencils! Use them in crafts or for pumpkin carving. So, you're looking for out of the ordinary, funny Pumpkin Patterns or Stencils, right? Well, here you'll find one to carve your pumpkin and another for all your other Halloween Crafts and Projects. Let's start with this goofy toothy Jack. He's great for your pumpkin design but don't sell him short. You can paint him on a paper bag for a cool trick or treat bag. Or let the kids paint him on paper and hang in the window. There is so much you can do with stencils. For more Halloween Crafts and Ideas, don't miss the video at the bottom of this page. Oh, by the way, if you like the idea of just printing free stencils and getting your project started right away, then don't miss the Printable Halloween Stencils and look around here too for all the project ideas. Of course, Halloween is really all about being scared out of your wits, right? But then again if you are planning the outing for kids you may want to tame it back a bit and that’s why these cartoon pumpkin stencils are so useful. But if you want to take the spooky path then check out the free Scary Pumpkin Stencils. When you are searching for Free Pumpkin Stencils it isn’t quite clear if you want a pattern to carve a pumpkin or a pattern of a pumpkin. No matter! 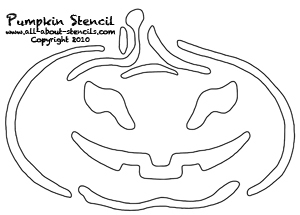 Here you’ll find Free Pumpkin Carving Stencils and many Free Halloween Pumpkin Stencils. Enjoy! Hey! Don’t forget that I (and everyone else) want to see what you have done with your cartoon pumpkin stencils. Just click on Stenciling Projects to get your masterpiece showcased here on this web site. Won’t that be exciting! Or if you have any questions or want to share information join in on the Stencil Blog. Stencil Blog. Well, I hope to hear from you soon. Wait, wait! Don't go yet! Here's a video with a few more Halloween craft ideas. Enjoy! 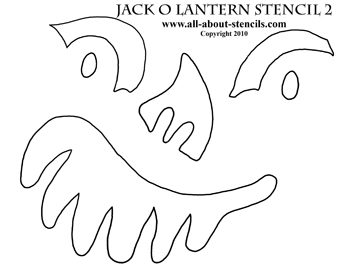 Return to Home Page from Cartoon Pumpkin Stencils. Return to Halloween Crafts from Cartoon Pumpkin Stencils.